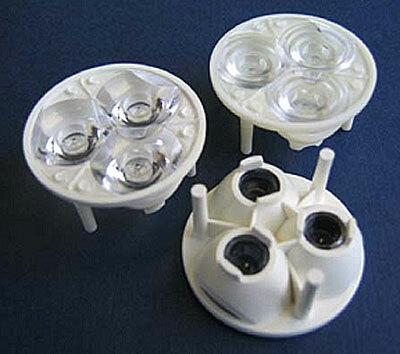 This tri-lens assembly is compatible with Luxeon K2 LEDs and is assembled into a 35mm diameter holder sized for MR11 applications. The holder ensures the proper relative placement between the lens and the Luxeon LEDs. Heat staking the legs of the holder to the support provides excellent mechanical strength.